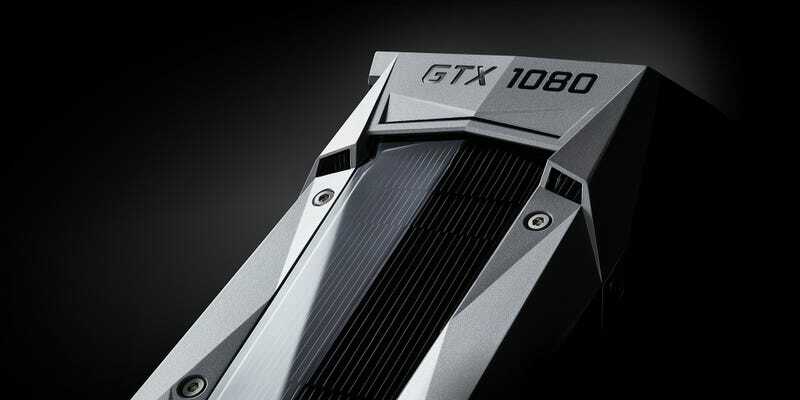 Last year Nvidia introduced the top-of-the-line GeForce GTX Titan X, a $1,000 beast of a graphics card that blew just about everything else out of the water. Well forget that old thing. The newly-announced GTX 1080 is nearly twice as powerful for several hundred dollars less. Nvidia hosted a special event on Twitch last night to unveil the GTX 1080 and the slightly slower, slightly cheaper GTX 1070, a pair of cards designed to demonstrate what the company’s new Pascal architecture can do. As far as gamers are concerned, that can be summed up in a single slide from the presentation. Note the relatively low performance of Nvidia CEO Jen-Hsun Huang. A similar chart from the 1080's page on Nvidia’s website shows an even more impressive jump over the previous best in GPU. Why the disparity? I am guessing someone got the scale wrong on one slide or the other. (Update: As the comments pointed out, one chart is relative VR performance. Tiny text is tiny.) We’ll know for sure once the cards start getting into the hands of benchmarking experts later this month. Perhaps then we’ll see why the 980 TI isn’t being compared here. What’s most impressive about the new cards isn’t the billions of dollars Nvidia sunk into research and development, the faster faster type of graphics card memory being utilized (GDDR5X) or the smaller 16nm FinFET chip that uses less power and produces less heat. It’s the price of the damn things. The GTX 1080 is more powerful than a Titan X and at least $400 less. It’s supposedly more powerful than two GeForce GTX 980 cards, one of which currently runs around $600. I say currently because there’s no real reason to keep those two cards at those prices once these hit the market later this month. Here’s the 1070, which is coming June 10. You can read all about the new cards and other things Nvidia got all excited about over at the company’s website.